They say a picture’s worth a thousand words. The chart above is a great example of that. The thousand words it reminds me of are all the ones used in all those Microsoft TV ads for the Surface tablet that seem to be on every 10 minutes. The ones that always feature an actor blabbing about how the iPad is not for ‘real work’ and how the Surface is the right tablet for anyone who needs to do ‘real work’. 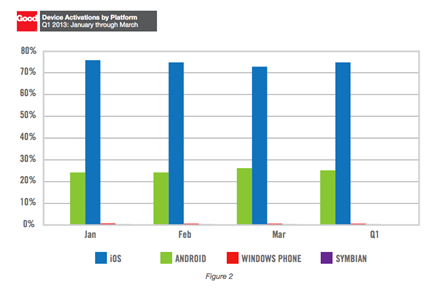 The chart above is from the Good Technology Mobility Index Report for Q4 2013. This tracks the impact of mobile apps and platforms in the enterprise – an area where people have been know to do quite a bit of real work. The iPad is the runaway leader, with over 91% of activations. Android tablets come in second, with under 10%. 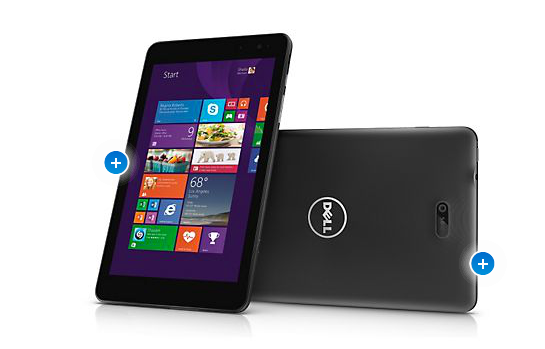 The other thing that jumps off the page on the chart: where’s the tablet that’s so perfect for real work? Nowhere. Zero percent. Not even on the chart. Latest Enterprise Mobile Device Activations Report: Who Cares about a Powerpoint App? The latest report on enterprise activations of mobile devices from Good Technology has very good news for Apple, the iPad and iPhone, and Android. 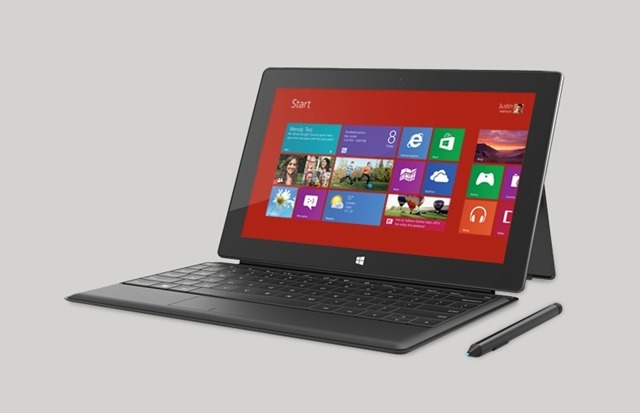 And some very grim news for Microsoft and their Windows Phone and Surface tablet lines. See the teeny, tiny sliver of red in the chart above? That’s the Windows Phone share of device activations in the report. The Surface tablet line doesn’t even manage a sliver of the chart for tablet activations. With a diverse global customer base that includes FORTUNE 100™ leaders in commercial banking, insurance, healthcare, retail, government, and aerospace and defense, Good is uniquely positioned to provide insight into the adoption of new mobile platforms and devices. Good Technology analyzed the mobile devices activated by its customers over the first quarter of 2013 to highlight trends in mobility and device preference. — iPad Dominating: The latest generation of iPad devices (iPad 3 and beyond) now lead as the most widely used tablets among Good customers, and Apple continues to hold a strong grasp on the tablet market with 88.4% of total activations. 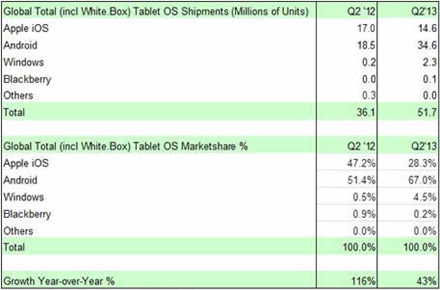 — Android Gaining Momentum: Activations from Android tablets almost doubled during Q1 2013, while Android smartphone activations remained consistent compared to Q4 2012. — The Only Way Is Up? : Windows Phone has the largest opportunity for growth, with less than 1% of total activations, as it continues to be dwarfed in comparison to the global market leaders. When I see these sort of numbers I can’t help but think about those cocky Microsoft TV ads touting Windows 8 tablets and trashing the iPad. The ones that highlight how terrible it is that there’s no Powerpoint app on the iPad – something that would seem like a big deal to, say, enterprise users maybe. 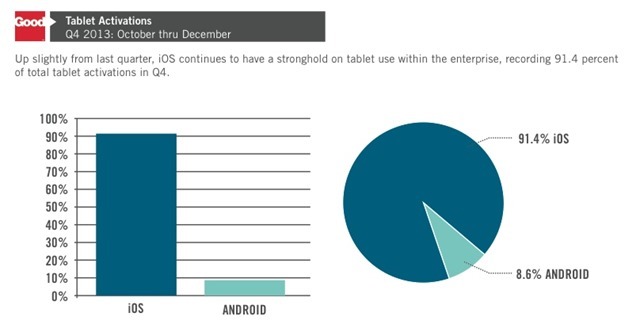 Well, the Powerpoint-less iPad is going like gangbusters in the enterprise, Android tablets with no Powerpoint app are showing some momentum too. Windows 8 tablets with Powerpoint – not even a 1% sliver on the chart. Maybe it’s time to talk about an Excel app in the ads. 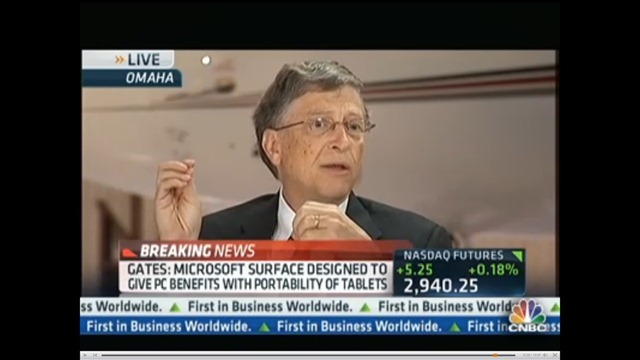 Bill Gates has shared some thoughts on the iPad again, during a CNBC interview – this time claiming that lots of iPad users are frustrated at their lack of ability to do things like type or create documents. … but a lot of those users are frustrated. They can’t type, they can’t create documents, they don’t have Office there. So we’re providing them with something with the benefits they’ve seen that have made that a big category without giving up what they expect in a PC. Really? People used to talk a lot about Steve Jobs and a ‘reality distortion field’ – I’d say that the Delusion Bubble that Gates and Microsoft seem to live in is just as powerful. 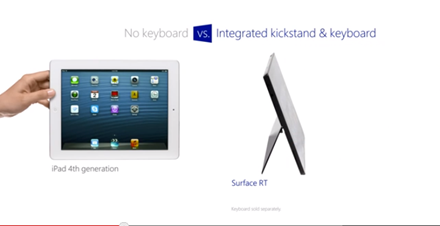 iPad users can’t type, can’t create documents – has he ever been near an iPad? For me, this is a bit like Tim Tebow talking about how many Denver Broncos fans are frustrated with that Peyton Manning guy. 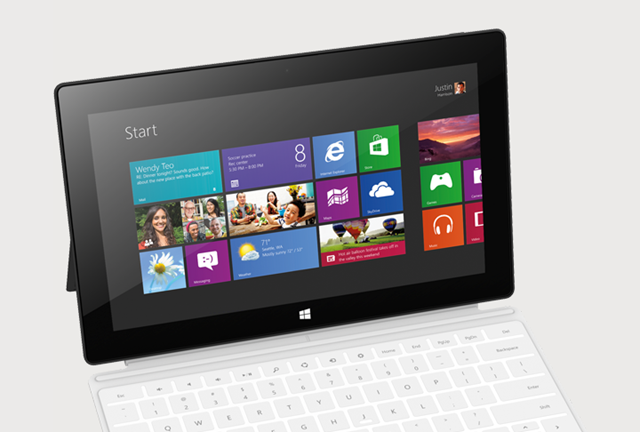 Microsoft might want to show that they can make a tablet that shows any sign of appealing to users before they dish out their thoughts on the supposed frustrations of iPad users.